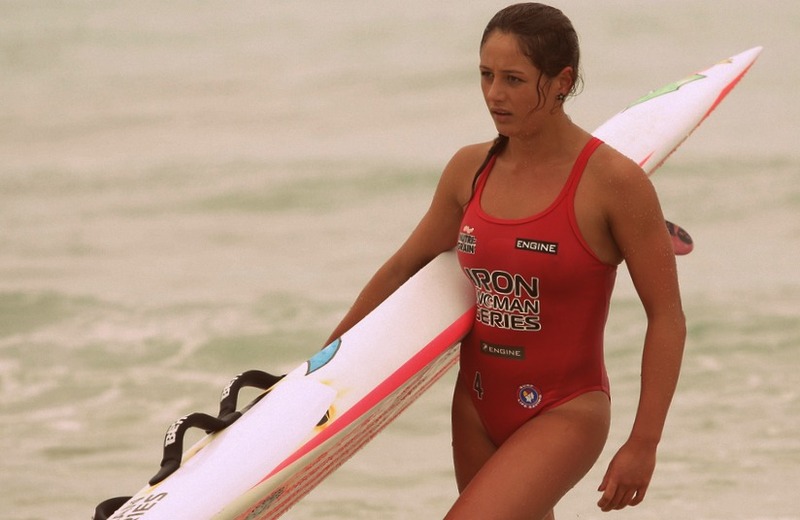 The Surf IronMan and Surf IronWoman events are the ultimate test of speed, skill, courage and endurance. 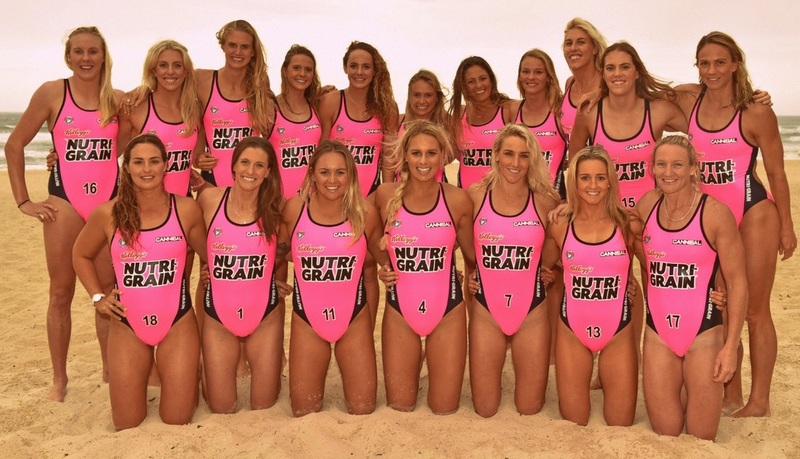 The athletes who take part are the elite of surf sports. 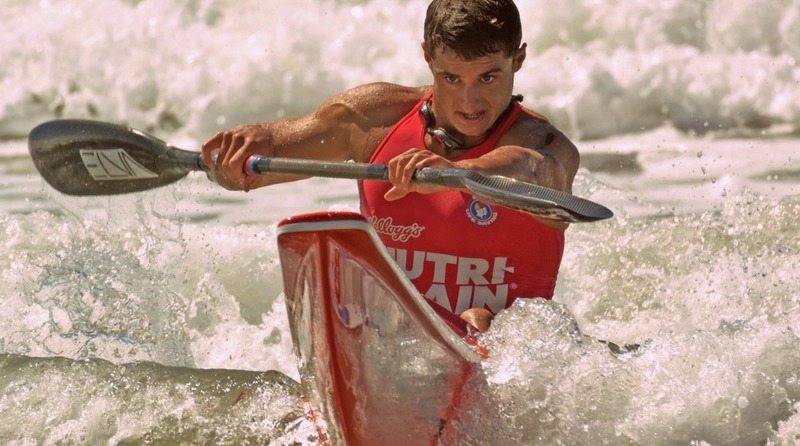 They compete in a grueling event that combines swimming, running, surf ski paddling and board paddling. This combination of disciplines is also known as a Taplin event, and a ballot is held at the start of the carnival to determine the sequence of legs. A race typically lasts for 40-50 minutes in total. To compete at the top level, IronMan and IronWoman competitors must excel in all four disciplines. A single weak leg can leave an athlete so far behind that it becomes impossible to catch up. IronMan racing originated in the 1950s in Australia and the United States. In 1956, competitors from Australia, South Africa, Hawaii, New Zealand and the USA competed in a series of swim, board and ski races at Collaroy Beach in New South Wales. But the competition really took off in 1966, when the IronMan event was first included in the Australian Surf Life Saving Championships. Women were first permitted to compete in IronWoman events in the early 1990s, at first competing in only the swim, run and board legs, with the female ski leg being added several years later. The sport has undergone a variety of format changes over the years. Popular modern formats include the Loop, the M-Shape course, the Eliminator, and the Triple Sprint. The image below depicts a typical course. Competitors may have to complete two or three circuits of the course, repeatedly transitioning between board, ski, swim and run. Because different competitors have different strengths, the overall leader can change many times during the race. Even a competitor with a substantial lead can lose position if they come off their board or ski at the wrong time. Note that the Surf Ironman should not be confused with the Ironman Triathlon event, which consists of a 2.4-mile swim, a 112-mile cycle, and a 26.2-mile run. The triathlon is a predominantly lower body sport, whereas IronMan is mainly core and upper-body. The technical and surf skills required for IronMan are also very different to the skills required for a triathlon. Internationally, the Surf IronMan is sometimes referred to as an Oceanman. The surf swim leg of an IronMan or IronWoman requires competitors to run into the ocean from the beach and then proceed through the surf zone by wading, duck-diving and dolphin-diving under and over waves until they reach deep water and can begin swimming freestyle. 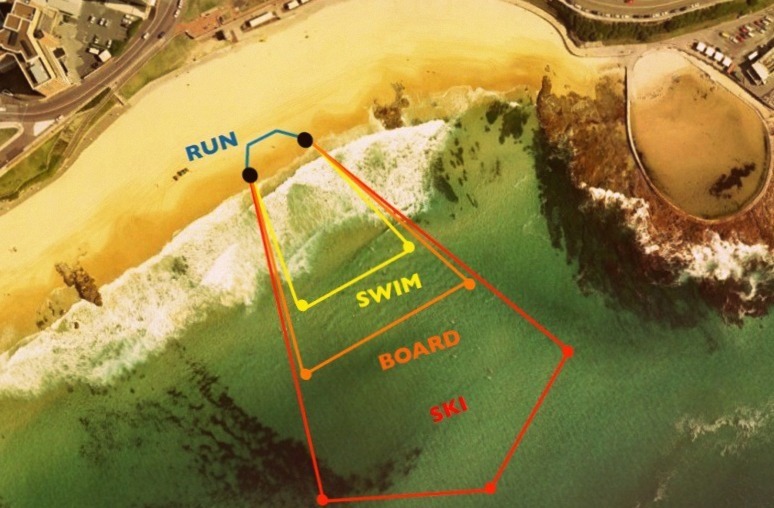 The swimmers then sprint around cans (buoys) and return quickly to shore, while attempting to catch waves (or bodysurf) to gain ground on their rivals. The bigger the surf, the harder it is to swim out, however the return trip to shore can often be quicker in large surf, if the right wave is caught. In the board paddle event, competitors race through the surf and ocean on racing mal paddleboards, which are a 3-metre-long fibreglass or carbon fibre boards, with a foam core. The athletes begin by running down the beach towards the ocean, holding the board by their side. When they reach sufficiently deep water, they jump onto the board and paddle through the surf zone while either lying prone or balancing on their knees. They must pop over, or roll under, any incoming waves they meet on the way out. Once past the breakers, competitors paddle around cans before returning to shore, attempting to catch waves on the way back in. 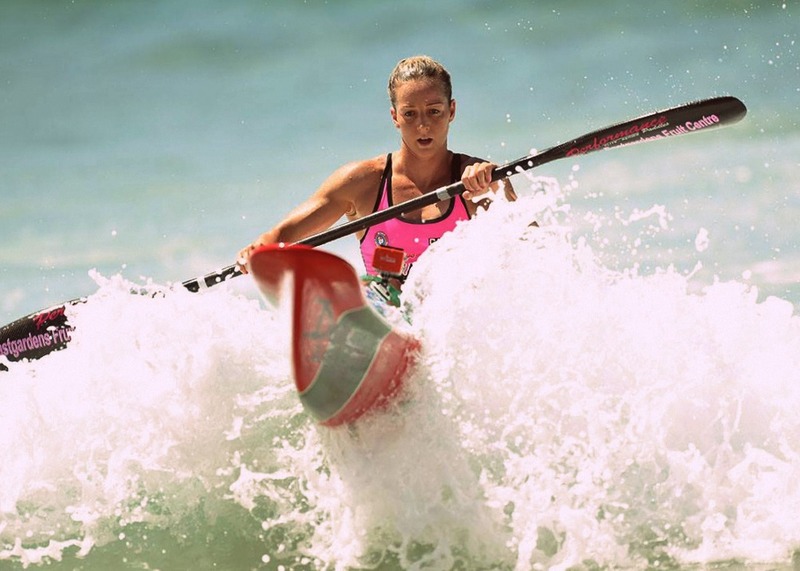 Experienced paddlers can slipstream behind their rivals to reserve energy. In large surf, competitors can be tumbled and dumped by waves, and boards can easily be torn from the grip of the paddler, forcing a lengthy swim back to shore, and plenty of lost ground. The surf ski is the longest, fastest, most technically difficult, and riskiest leg of an IronMan or IronWoman event. Competitors paddle six-metre-long skis that weigh up to 20kg. They're similar to an Olympic kayak, only longer and narrower. Sitting on a seat in the middle of the ski, athletes use a twin-bladed paddle to propel themselves through the ocean. A rudder at the back of the ski is controlled using the feet to adjust the direction of the craft. Surf skis are very narrow and difficult to balance, but they cut through the surf like an arrow - as long as they're pointing in the right direction. However, if a wave is approached at the wrong angle (or allowed to hit the craft from behind at the wrong angle), the surf ski will be spun around parallel to the wave and then flipped over, throwing out the rider. It's extremely hard to recover a broadsided ski in large surf, because it will be quickly pushed to shore by the wave (often taking out several rivals in the process) and leaving the competitor floundering in the ocean. The run legs, normally over soft sand, are used to transition between each of the other race legs. While the run is the shortest leg, it's not a chance to slack off. In fact, this is the leg where the most aggressive competitors can gain vital seconds on their rivals.